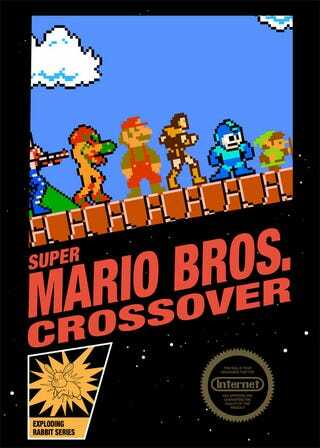 What if Exploding Rabbit's excellent Flash game Super Mario Crossover were a real Nintendo game? It would probably look something like this. This awesome box art was mocked up by Steve Napierski of Dueling Analogs, a comic we regularly feature in our Sunday Comics posts. Seems he was just as charmed by the game as we were, and wanted to show his appreciation. Play Super Mario Bros. As Mega Man, Link, Samus, And More! Of course I would have preferred the game and box art featured Luigi, Ryu Hayabusa, and the tank from Blaster Master, but you take what you can get. For a printable copy of the box art, check out the link below.